I love the idea of both functional art that is useful around the home, as well as the trompe l'oeil "fool the eye" art style, so I decided to combine the two on this unique wooden Butler's Serving Tray. 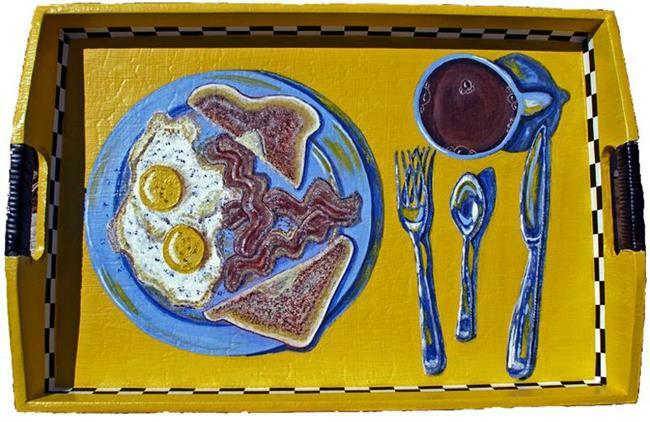 The image I created here on the tray is of a delicious, mouth-watering breakfast consisting of 2 sunny side up (peppered) eggs, 3 greasy bacon slices, 2 slices of buttered toast, & a hot bubbling cup of joe (coffee) to wash it all down with, along with 3 pcs. of silverware (a fork, spoon, and butter knife). 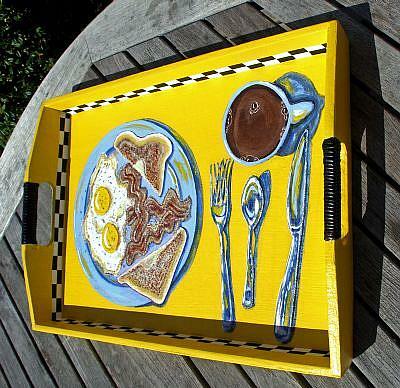 When I was a young child, I recall my mother asking me & my brother what we'd like to eat for breakfast, and my most often request was for what I referred to as: "Dip-in" eggs (my term for "Sunny-side up eggs") because we ALWAYS dipped the toast into the yellow eggs yolks, to eat them, of course! Even to this very day, I sometimes still refer to sunny side up eggs as "dip-in" eggs, and it brings back so many wonderful & flavorful memories of family breakfasts! (Doesn't everyone do that? --I also had my own unique term for "shredded wheat" - as a kid, I used to call shredded wheat: "Pillows" since that's they shape it looked like to me, but I digress). Back to THIS breakfast image, at hand. "Blue plate special is a term used in the United States by restaurants, particularly (but not only) diners. It refers to a specially-low-priced meal, usually changing daily. In contemporary use, a "blue-plate special" can be any inexpensive full meal, any daily selection, or merely a whimsical phrasing. Each element in this painting has a shadow that is being cast from it to add depth and believability to the whole, and the individual shadows have colors reflected in them as well. (The imagined light source is coming from the left, so the shadows are on the right of each object). 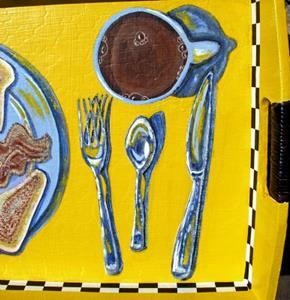 One of the challenges of this piece was to create realistic looking reflections in the silverware, which, if you look closely, you can see; there's a reflection of the blue dishes, (cup & plate) as well as the yellow of the tray, since silver utensils reflect the colors of everything around them. As a whimsical finishing touch, I added a black & white checkerboard pattern border lining the inside of the tray, that adds to the "old-time, greasy spoon diner" feel. Americana at it's finest! Again, this is quite functional art, and it's also a great conversation piece for entertaining guests. I signed it on the side. 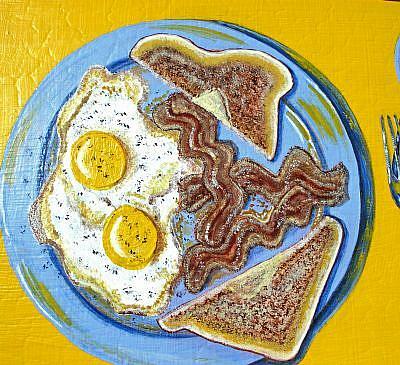 Two sunny-side up fried eggs; peppered to taste, 2 slices buttered toast, 3 slices crispy bacon, and a bubbling cup of hot coffee. Guaranteed to Wake you up with flavor!